Description: When Deputy Ken Brody's sweetheart goes missing in the mountains outside Timber Creek, Mattie Cobb and her K-9 partner Robo are called to search. But it's mid-October and a dark snow storm is brewing over the high country. And they're already too late. By the time they find her body, the storm has broken and the snow is coming down hard. 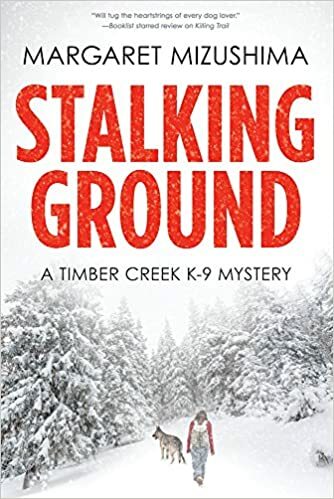 My Thoughts: STALKING GROUND is the second mystery starring Mattie Cobb and her police dog Robo. This time another deputy's girlfriend goes missing. Robo can't find her scent when her car is located leading law enforcement to believe that there has been foul play. An anonymous tip leads them to the woman's body which confirms foul play and begins their investigation. Mattie is also dealing with family issues. She spent a good part of her life as a foster child and, while she ended up in an excellent foster home, she is still trying to connect with the brother she hadn't seen since she was a teen. He finally makes contact and drops a bomb during their conversation that makes Mattie reevaluate her childhood memories. Mattie is also in the beginning stages of a relationship with Cole Walker who is the local veterinarian and the divorced father of two girls. Cole and his family are also going through some readjustments after his wife's abandonment of the family and their divorce. He is a busy father who isn't quite certain how to deal with the emotional fallout the daughters, especially the oldest daughter, are suffering. This was an exciting mystery with lots of thrilling parts. It also has a great relationship between Mattie and her dog Robo. I liked that Mattie is starting to make more connections with the humans in her life too. "Did you have a good experience in her home?" "The best. Thank goodness for that. She straightened me out." She gave him a pointed look. "But I'm thinking of your kids and hoe they must feel. Abandonment issues can really mess with your head. You'd be smart to get the girls professional help early before real problems start." I got this one in exchange for an honest review from Julia at Kaye Publicity. You can buy your copy here. Sounds really good. The author is new to me. I am impressed you managed to get in your 10,000 steps in addition to reading so much and working.